We love Brussels sprouts in our household and apparently so do many of the readers of this little food blog since my Roasted Brussels Sprouts with Balsamic-Maple Vinaigrette gets crazy popular this time of the year! My other recipe using Brussels sprouts and butternut squash is proving to be a hit this season as well. It’s probably because Brussels sprouts are in season; they're abundant near the end of September thru to February. All the salad ingredients (minus the vinaigrette). Amounts and Ingredients listed below. Well, it depends. For all Brussels sprouts, it is best to pick the ones that are bright green, compact in appearance, and firm when you squeeze them. My preference is to pick the smaller sprouts since they tend to be sweeter and more flavourful while the larger ones are more cabbage-y and bitter in flavour. Tip #2: How do you shave (thinly slice) Brussels sprouts? I’ve got three ways to prepare these little green vegetables. For all methods, it's important to rinse the veggies, cut off the dry stem of each sprout and remove the bruised, loose leaves before slicing them up. Hardest: Use a sharp knife. This one requires the most amount of care and time. Slice each Brussels sprouts in half before finely slicing up the sprouts. Using a knife may not create the fine texture that can be created using the other methods. Medium: Use a mandoline. Using a mandoline creates a nice uniform cut and is faster than a knife (unless you’ve got the skills!). Watch out for your fingers though as the blades on the mandoline are sharp. Easiest: Use a food processor. This is what I used. It's by far the fastest and easiest method. Plus your fingers are safe. Using the slice attachment, simply whiz the Brussels sprouts through the machine and you’ve got shaved/shredded Brussels sprouts in a couple minutes. What else is in this salad? Delicious, seasonal pomegranate arils (seeds) and sliced Gala apples. 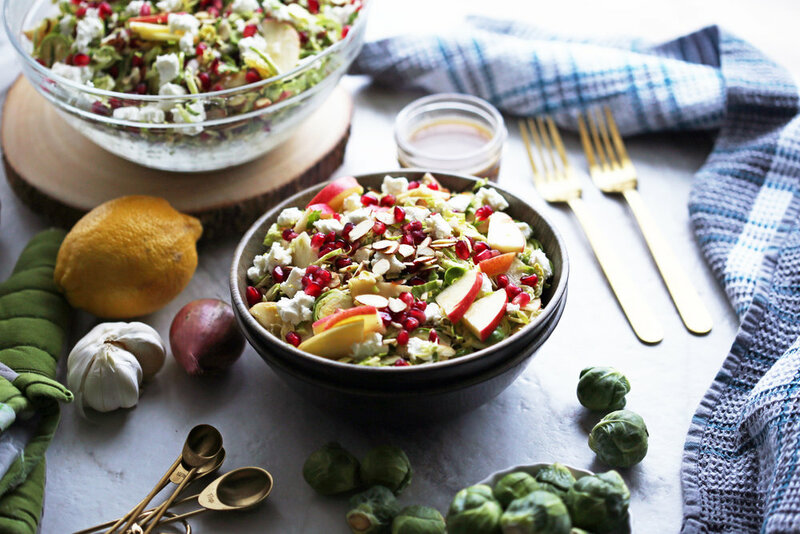 Not only does it add a nice fresh, sweetness to the salad, but a lovely red colour that contrasts with the green of the sprouts for those holiday colours! In addition, it adds a nice crunch to the salad as well. Speaking of crunchiness, there are sliced almonds, which also adds a nice nutty flavour. Slivered almonds would be great in this salad too or other nuts such as pine nuts or toasted pumpkin seeds would be wonderful. A finely diced shallot gives the salad a nice onion/garlic flavour that’s mild and sweet, but with a little bite. Since I put cheese in everything that I can, this salad uses a creamy, soft goat cheese. I like to crumble the soft cheese into the salad and mix it well with the other ingredients as the mild saltiness and flavour of the goat cheese goes well with everything in the salad. Finally, a basic lemon-balsamic dressing is used to give the salad a bright citrus flavour that compliments the other ingredients. I hope you enjoy this salad! 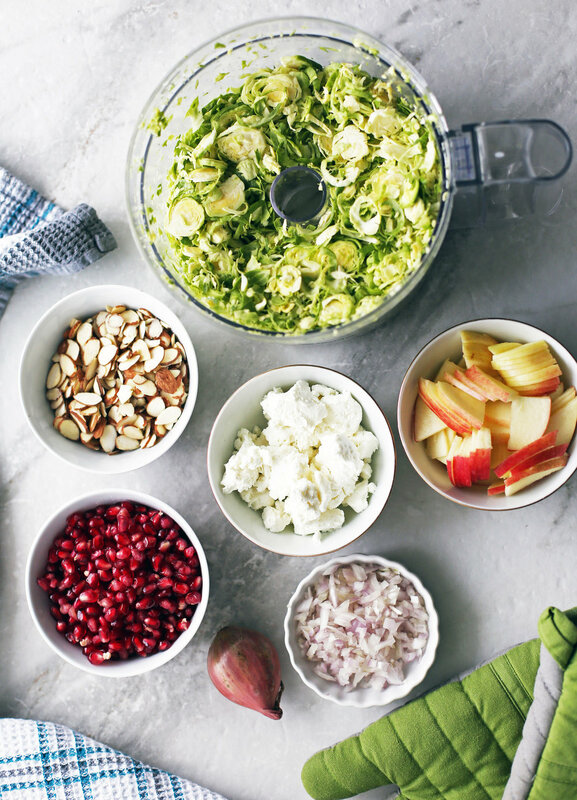 In the large bowl, assemble the salad by combining all the salad ingredients together. Drizzle the desired amount of vinaigrette on top and toss to combine. Serve immediately. I used a food processor with slicing disc to quickly slice the brussels sprouts. You can also use a mandoline or a sharp knife to make shaved Brussels sprouts, but it will take a little longer. I used Gala apples in this recipe. Substitute with any apple of your choice if you like. Nutritional calories represent one serving with eight servings total.